Hi y’all! I hope everyone is having a fantastic week so far. Things are going well for us. Ben and I are both immensely busy – Ben with planting, me with writing. We are also moving to the farm at the end of this month, so we’ve got to find time to pack and move somewhere in there :). It will be so nice to be living right out on the farm. Right now we live a couple miles from downtown Raleigh – and while we’ll miss our neighbors, I know Ben won’t miss the commute. Charlie Parker (our dog) will be thrilled to be somewhere where he can roam more freely as well. He is a country/farm dog at heart. Probably the thing I’ve missed most since we’ve been living in Raleigh is the stars. They are sometimes visible from here – but it’s nothing compared to a nice, dark country night sky. I can’t wait! Ben has gotten the first round of tomatoes in the ground – and eggplant and peppers are next this week. Also, the sugar snap peas are trellised and blooming. It won’t be long before we have some tasty sugar snap peas to offer for CSA members and market. Please remember to send me your information if you’re interested in participating in the “getting to know each other” activity. I’ve received a few responses, but I’ll wait to post anything until I get a few more. Again, you can send your info and a picture (or multiple pictures) of yourself, your family, your pets, or anything else to parker.patricia@gmail.com. I’d like to share a recipe with folks. 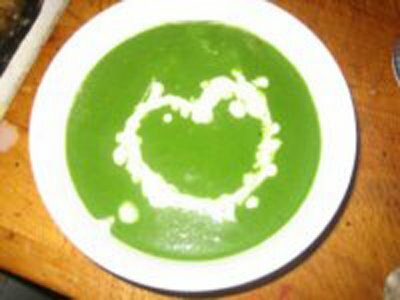 It was in the nineties yesterday, so I thought chilled soup might be appropriate :). I haven’t tried it yet, but I will be doing so soon. This recipe calls for green onions and spinach (among a few other things you’ll want to pick up from other farmers at market – or the grocery store). It’s from Farm Fresh Recipes by Janet Majure. 1. In a saucepan over medium-high heat, saute green onions in butter until soft, 3-5 minutes. 2. Add cucumbers, broth, spinach, potatoes and pepper. Bring to a boil, then reduce heat and simmer, covered, until potatoes are tender, about 15 minutes. 3. Puree is blender, working in batches. Transfer to bowl and stir in almost enough cream to reach desired consistency. Add lemon and salt to taste. 4. Chill several hours. Serve with thinly sliced cucumber and garnish (or garnish with cream as in the picture). Well, that’s it for now. See you soon! ← tat soi and kale and spinach oh my!